Abstract. To sustain growing food demand and increasing standard of living, global water use increased by nearly 6 times during the last 100 years, and continues to grow. As water demands get closer and closer to the water availability in many regions, each drop of water becomes increasingly valuable and water must be managed more efficiently and intensively. However, soaring water use worsens water scarcity conditions already prevalent in semi-arid and arid regions, increasing uncertainty for sustainable food production and economic development. Planning for future development and investments requires that we prepare water projections for the future. However, estimations are complicated because the future of the world's waters will be influenced by a combination of environmental, social, economic, and political factors, and there is only limited knowledge and data available about freshwater resources and how they are being used. The Water Futures and Solutions (WFaS) initiative coordinates its work with other ongoing scenario efforts for the sake of establishing a consistent set of new global water scenarios based on the shared socio-economic pathways (SSPs) and the representative concentration pathways (RCPs). 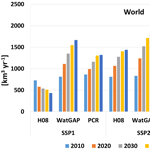 The WFaS "fast-track" assessment uses three global water models, namely H08, PCR-GLOBWB, and WaterGAP. 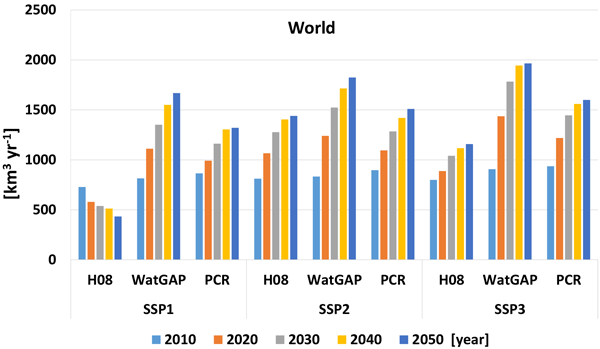 This study assesses the state of the art for estimating and projecting water use regionally and globally in a consistent manner. It provides an overview of different approaches, the uncertainty, strengths and weaknesses of the various estimation methods, types of management and policy decisions for which the current estimation methods are useful. We also discuss additional information most needed to be able to improve water use estimates and be able to assess a greater range of management options across the water–energy–climate nexus. How to cite: Wada, Y., Flörke, M., Hanasaki, N., Eisner, S., Fischer, G., Tramberend, S., Satoh, Y., van Vliet, M. T. H., Yillia, P., Ringler, C., Burek, P., and Wiberg, D.: Modeling global water use for the 21st century: the Water Futures and Solutions (WFaS) initiative and its approaches, Geosci. Model Dev., 9, 175-222, https://doi.org/10.5194/gmd-9-175-2016, 2016.